My freezers are now full with lots of pre-cooked (or ready to cook) meals that I have made in the last few weeks preparing for the arrival of my first baby, including this recipe. I love cider but even before I was pregnant, I couldn’t drink alcohol as it always gave me a migraine no matter what I drank – even one glass. The drink that I miss most is cider, so I’m always interested in new recipes that include cider as an ingredient. This is a great dish for winter, it takes a little time but the oven does most of the work for you. 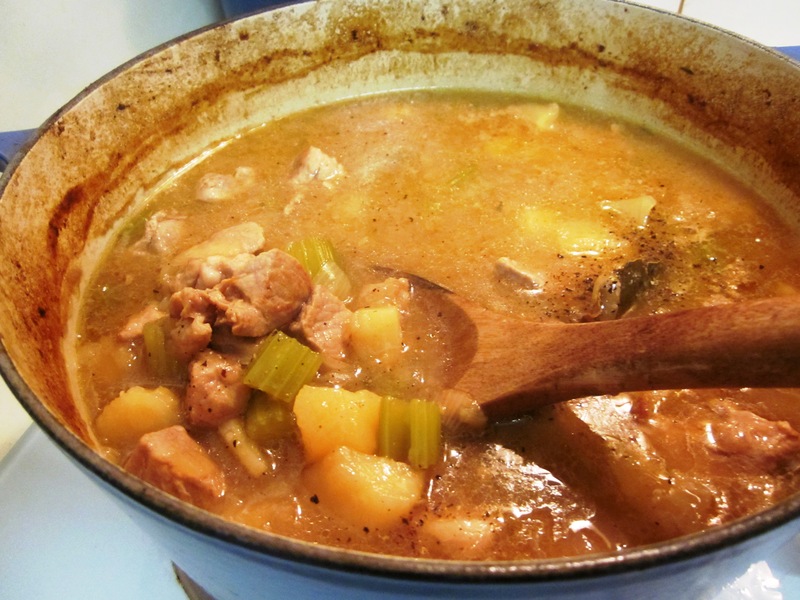 Depending on the size of your pork and vegetable pieces, it could take a bit longer to cook than the recipe states. The original recipe results in a very thin sauce, even after I reduced the amount of liquid in it. So if you want a thicker sauce add more flour at the beginning or a bit less liquid. However I didn’t mind as it was soaked up in my mashed potatoes. Potatoes were one of the few things I could eat during the first four months of my pregnancy. You’d think I’d have had enough of potatoes after that but they are still one of my favourite things to eat. Pre-heat the oven to 160C fan forced (180C with no fan). Heat a large flameproof casserole dish (that has a lid) over a medium high heat with the olive oil and brown the pork in batches. Set aside the pork for later once browned. It should only take a few minutes on each side to brown the pork in a hot dish. 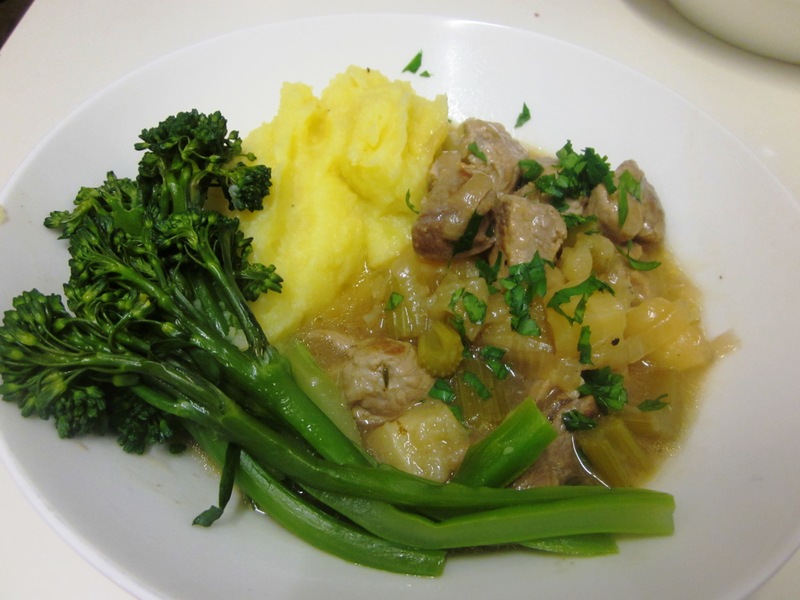 Once the pork is brown and removed, add the onions and cook for a few minutes until they start to colour and soften, then add the celery, parsnips and bay leaves and cook, stirring for 5 – 10 minutes until golden brown. Add the flour, mix and cook for about a minute then return the pork and any juices to the casserole dish. Add the cider and stir to combine, allowing the cider to boil for a minute or two to get rid of the alcohol then add the stock. You just want enough stock to cover the pork and vegetables. You can always add more later if it starts to dry out. Cover the dish and cook in the oven for two hours, stirring part way though (and checking there is still enough liquid). If the sauce is a bit thin at the end of the two hours, place the casserole dish back on the stove top over a medium high heat. In a small bowl, combine the cornflour with a small amount of water and stir to combine then add to the casserole. Boil for a few minutes until the sauce thickens slightly. Alternatively you could add this for the last 25 minutes of the cooking time. Serve sprinkled with parsley, with mashed potatoes and greens.